Demodex is a parasitic mite that causes a skin disease often referred to as mange. The microscopic Demodex mites live in the hair follicles and oil glands of your cat’s (or dog's) skin or at the skin surface. Cats are also host to a sarcoptic mite called Notoedres. The resulting disease is often referred to as scabies. Although animals often harbor Demodex mites, most healthy animals are able to suppress the populations. How will mange affect my cat? Demodex mites create patches of hair loss that may cause mild irritation and itching. Notedres mites create inflamed areas that are extremely irritated and itchy to the cat. Diagnosis of mites is made through skin scrapings of the affected areas. Most common infestations are found on the head and neck and less commonly on the trunk and limbs. How do I prevent my cat from getting mange? First and foremost, maintaining your cat’s overall health is critical to creating immunity to mite infestations. 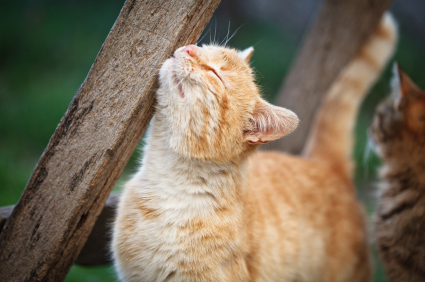 A good diet and clean environment can greatly reduce the opportunity for your cat to develop mange. Because some mites are transmitted by other cats, areas where cats congregate can create greater risk for mite infestations. Infestations can be treated. Consult your veterinarian for additional prevention strategies and treatment options. Can humans be harmed by mange? Demodex mites pose no threat to humans. Certain scabies mites can cause temporary lesions in humans but this occurs infrequently. For veterinary professionals, more detailed information on Demodex mites can be found at https://www.capcvet.org/guidelines/demodex/. If your cat has patches of hair loss or inflamed areas that are very itchy, especially on the head and neck, it may have mange. Mange is caused by a tiny mite. While many cats have some of these mites, if they are in good health, the mites usually cause no problems. Keep your cat healthy with good diet and clean environment. Your veterinarian can treat mange if your cat has it. A healthy pet can usually handle demodex mites without developing symptoms, so if your pet has no symptoms, no treatment is necessary. However, if a cat does get the symptoms of mange, it may have secondary infections as well. You veterinarian can prescribe a course of treatment to prevent the problem from getting worse.